Highway 1 is, without potentially offending any other highway lovers, quite possibly the most beautiful highway in the country. From bluff, to beach, and then back to bluff, and then even up into the beginning of the redwoods, the route spirals road trippers (and the lucky souls who live on the coastline) up and down the ocean’s edge. Beneath you—and sometimes beside you—the sea laps up to the shore and the horizon dies off in an endless blue. To your other side, the green and golden hills rise steep like castle walls as creeks trickle down through their hidden valleys. Doesn’t sound bad, does it? While this list is certainly not all-inclusive—no way can we put every single attraction of Highway 1 on a single list—but these 13 spots are among the best this iconic route has to offer. In geographic order, from the bottom of the Golden State to the top, here’s where to pull the car over. Never one for a dull moment, Venice Beach is about as eccentric as they come. Known in the Dogtown days for its surf and skate, this stretch of sand has adopted personality after personality over the years. Stroll, run, or even ride your cruiser bike down Ocean Front Walk. The skate park is reminiscent of the original ‘Z-Boys’ who brought skateboarding to life on the California coast, and the smooth bowls are usually packed with both locals skating inside and onlookers watching from the rail. Further down are the pick-up basketball courts (complete with stands for heckling onlookers), handball courts, and the fishing pier. The entire row along the beach is full of flashy and quirky vendors, and varying street performers. With this, it’s not hard to forget that across from all the Ocean Front Walk is, well, an ocean full of beachgoers. When the iconic Route 66 finally ends at the sea, that’s where the fun starts: The Santa Monica Pier. It’s nonstop action on the pier, from Thursday night concerts to the Pacific Park ferris wheel, from the Playland Arcade to the Trapeze School, and so much more. Just a stroll north of Venice Beach on the sand, past the countless beach volleyball courts, and you’ll see the pier long before you set foot on it. The beaches on both sides are vast and the water is warm, so after you rent a bike by the pier, make sure to take a dip in the ocean. Or grab a burger, or pretzel, or some classic seafood while wandering the pier. This is iconic pier fun, brought back from the old days and reignited. Right beneath the nose of the coastal highway, beach-goers sunbathe at the base of the bluffs along El Matador State Beach. The sandy beach may be thin from bluff-to-swell, but it stretches out surprisingly long from pocket to pocket between sea stacks, bluffs, and caves. Just north of Malibu, you might miss it. But down below, one of the most beautiful beaches along the drive is packed with energy: picnic on the bluffs or scramble on the rocks, timing the waves to sneak through the sea caves to the next beach section. The further you go, the more space you have to yourself. Just be sure you take note of the tide so you can get back to your car! As you drive by the town, you’ll start to feel the urge to take the surfboads off the top of the car and test the water. Or maybe you can smell the food—burgers, hot wings, burritos, all of it—and have suddenly decided a margarita sounds necessary. Turns out, you don’t need much convincing to stay in the beachtown. Whether it’s the ocean that gets you out and about, or the mountains, Santa Barbara has it all. Some of Southern California’s best mountain biking is up in the Santa Ynez mountain range above town. Grab a post adventure beer at Santa Barbara Brewing after a paddle out at Rincon Point, or some of Lily’s Tacos when you get back from climbing out at Lizard’s Mouth. No matter what you choose, you can't go wrong in Santa Barbara. Now, how do you go from vacationing here, to living here? If you’ve ever opened a magazine or gone online and seen a picture of Big Sur, we can almost promise you that it’s of McWay Cove and Waterfall. Hardly a traveler along the 1 drives by without stopping to pull out the camera. The beach and cove, nestled not-so-subtly beneath a sharp bend in the Highway, may be off limits to trek down to—but it’s the sheer view from the top that draws hundreds of people a day to pull the car over. The waterfall pours down 80 feet to reach the sand just a few feet from the ocean—at high tide, the falls can pour directly into the cove water. Which, speaking of, is fantastic: the water ebbing in and out of the cove is a blue closer to a Gatorade flavor or Mediterranean sea than the cold and deep Pacific Ocean. Simply put, McWay Cove in Julia Pfeiffer Burns State Park, is the best stop in Big Sur—and that’s no easy accomplishment. But we’ll just let the photography do the talking. Every sunset over the ocean is different, depending on the clouds and light. Road tripping along the 1, you’ll spend your time looking forward to the sun kissing the horizon goodnight. But the best spots aren’t always the most famous spots: the best spots are the unnamed bluffs, the random dirt pullouts, and golden hills you sprint through to reach the edge of the coast, trying to get as close as possible as you watch the sun dip down in silence. It takes hours for the sun to reach the horizon, and then it only lingers for a moment, hanging in the brief and ethereal balance. It doesn’t matter where you are when it happens, just make sure you don’t let it slip by. You’ll pass by countless surf shops as you drive the coastal highway. A lot of them are really good. This one is great. Proof Lab : the surfing, skating, art, and outdoor community haven all rolled into two shops (and an indoor skate park where just three bucks gets you a day access to skate). The laid back shop stocks a large assortment of outdoor and lifestyle brands, from Patagonia to Levi's, to small, local, clothing lines that specialize in organic fabrics and hip counterculture designs and style. Located on the turn of Highway 1 as it realizes it is time to get back to the coast from Mill Valley, Proof Lab is the reason surf shops define surf communities. With friendly vibes, a helpful staff, and great product and knowledge, Proof Lab takes the cake. Prepare to salivate. The most recent location (401 Miller Ave) of the local Marin County favorite Sol Food is only a few blocks off of the highway’s stretch through small-town Mill Valley before it heads over the hills and back to the coastline. The Puerto Rican cuisine has carved out a cult following in Marin, spreading in all directions north of the county and south of the bridge into San Francisco. The simple ‘bistec’ sandwich is a go-to for all regulars, but don’t overlook the ‘pollo’ or ‘veggie deluxe.’ Inside the bright and tiny restaurant, sits community style and a character-filled place to devour your ‘pollo al horno’ combination with a tasty ‘limonada fresca.’ Don’t let long lines deter you—Sol Food is worth both the short detour and the (sometimes) long wait. Once up and over hills and back to cruising along the salty sea water, keep an eye out for Belvedere Ave and the Matt Davis Trail. From the town, it crawls up into headlands for four miles of stunning singletrack. From Redwoods to Douglas Firs, you run or hike under a canopy of trees, and might just forget where you are. The switchbacks might be slow as you run up, and your legs will most definitely feel the burn, but it will all be worth it on the descent. Fast and flowy, this trail cruises back down to complete the 8 mile jaunt in the woods. If you want to run it reverse, drive up the Panoramic Highway to the Pantoll Ranger Station, park there, and do the fun section first, saving the climb back up for later. But either way, whether it’s at the end or the beginning, be sure to wander over for a quick swim at Stinson Beach. Part of the Golden Gate Recreation Area, Stinson Beach is the hotspot for those living in (and traveling through) Marin County. About 35 minutes north of the bridge on Highway 1, Stinson Beach stretches up the coast for a few sandy miles until it hits the town of Bolinas. The waters are both swimmer and surfer friendly, and the beach hosts a large amount of picnic sites on the inland side of the bluffs. Come midday, walk through the parking lot and over a small wooden bridge, and grab a burger and shake at the Parkside Cafe. Stinson Beach is also known for (literally) being the finish line for the annual Dipsea Race—the oldest trail race in America, originating in 1905. California’s coast isn’t known for its climbing, but Goat Rocks, inside the Sonoma Coast State Park, is secretly flying under the radar. Where else can you climb as the sun sets over the ocean horizon? The outcrop of rocks that is the Goat Rocks crag is set a few hundred yards from the edge of the bluff, down in a golden, grassy, meadow. While mostly sport and top roping, there is an assortment of bouldering problems (this is not the place to seek out trad routes). The top rope climbs vary in the 5.7 to 5.10 range. Peak season to hit up Goat Rocks is in the summer and early fall, as it’s nice to get on the rock when the fog isn’t blanketing everything around you! 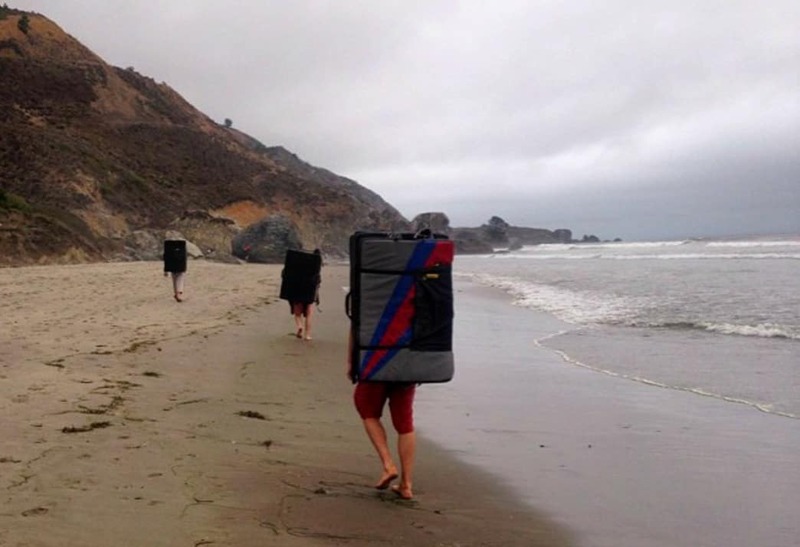 But for climbers looking for a scenic and quiet escape, an evening climb on the rugged Sonoma Coast is tough to beat. This small little crab company has about four or five outdoor benches, and no space for indoor heating. In fact, half of their outdoor property is taken up with cooking equipment. They’re small, simple, and fairly priced. They’re fantastic. 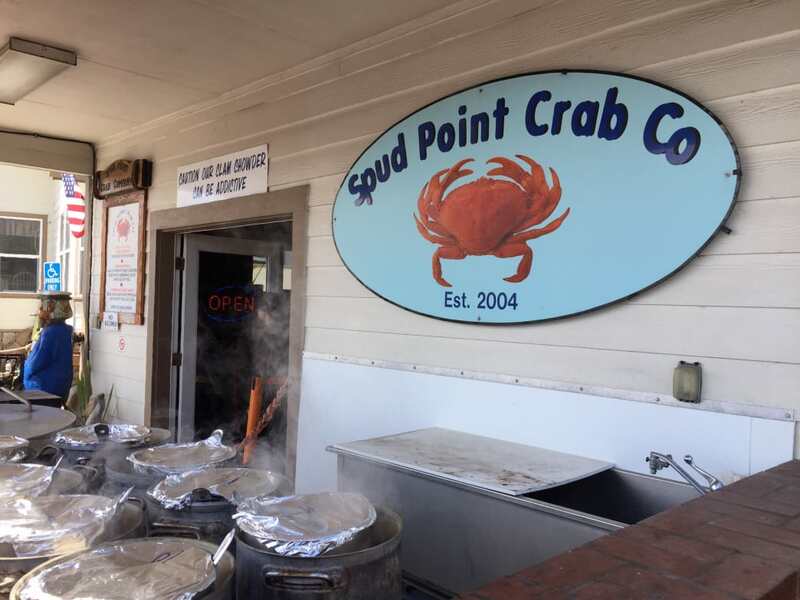 For the small price of $7, Spud Point Crab Company has the best clam chowder offered on the northern coast. The small menu also has crab sandwiches and some bbq options, but let’s be honest: you’re there for the clam chowder. Fresh, light, and filling, you’ll find yourself going back for more. Don’t say they didn’t warn you: this clam chowder joint has as cautionary sign above their entrance: “Our clam chowder can be addictive.” If seating looks spare—as it might be, due to the popularity of the chowder—grab your soup to-go and walk around the marina to enjoy a sunny, Bodega Bay day, full of the best clam chowder in your life. Located at 1860 Westshore Road, just a few turns and a few minutes off of Highway 1. You may have thought you left the scenic bluffs of Big Sur behind when you crossed over the Golden Gate and up into Northern California, a gentler—yet equally gorgeous and scenic—coastline. If the southern coastline is blistering, steep, and somewhat ferocious, her northern counterpart is nonchalant, unshaven, and intricate. Stump Beach, in the Salt Point State Park, has a small, sandy beach at the toes of a long and skinny cove. Up above, small trails wind along the bluffs, perfect for a casual run. You can hop from rock to rock and scramble up to brave the strong sea breeze. After exploring the beauty on the bluffs, return to the beach for sunset. It’s hard to choose which section of the coastline—south or north—you like better. But something about the quieter, farmland-style bluffs as you reach the redwoods in Northern California makes you feel nostalgic, about a home, dream, or escape you once had. You come to see Big Sur. But you stay for the small town, slow life vibes, scattered along Highway 1’s concluding turns.